For more than 20 years, Dr. Tsantilas Practice has been synonymous with excellence in diagnostics and treatment for patients suffering from vascular diseases. Our dedicated team of three physicians and ten medical assistants treats patients in all areas of vascular diseases. Having performed more than 34,000 surgeries in his own practice to date, Dr. Tsantilas is known as one of the most experienced specialists in vascular medicine in the Augsburg area. Located in the heart of Augsburg, not far from the main train station, the practice has operation rooms of its own for small-scale surgeries. 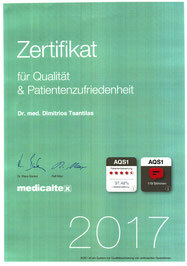 In addition, Dr. Tsantilas serves as an attending doctor at Diakonissenkrankenhaus Augsburg. The practice was certified as DIN EN ISO-9001:2008 in 2009. Prior to that (September 2006 – September 2009), it was certified as DIN EN ISO 9001:2000. Dr. Tsantilas is a certified practitioner of the Covidien ClosureFast technique, which he has applied more than 500 times, making him one of the most experienced practitioners using that method.